Sometimes called the "Star Bridge" because it provided access to the once extensive Star Ranch, Dorena Bridge is wonderful wayside destination. Drive through the bridge to a small parking lot. No longer part of the active infrastructure, the road ends here making Dorena Bridge a popular wedding and event site. The park includes restroom facilities and swimming hole access. Dorena Reservoir was engineered in 1946, followed by the construction of Government Road along its west bank. The filled reservoir covers the former town site named for area residents Dora Burnette and Rena Martin using a combination of both their first names. The community of 450 people was relocated 5 miles (8 km) upriver. Approximately a hundred homes and the rail road were dismantled or moved. There does not appear to be any remaining signs of the town, even when the water is drawn down in winter. To cross Row River, Dorena Bridge was added as part of the reservoir plan in 1949. The bridge was built for $16,547 under the supervision of Miller Sorenson, a Lane County foreman. 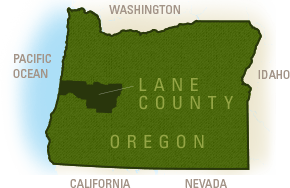 It provided access between the Star Ranch and Cottage Grove. The bridge was bypassed by a concrete bridge in 1974 and fell into disuse. 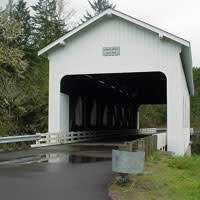 In 1987, along with its neighboring covered bridges, Dorena Bridge was fumigated and measures were taken for the structure&apos;s basic preservation. 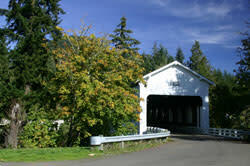 In 1996, the Oregon Covered Bridge Program grants facilitated a full rehabilitation and the creation of an adjacent park. The bridge&apos;s substructure and spans were replaced and the array of windows were installed to facilitate ventilation.